Gov.-elect Ned Lamont with Susan Bysiewicz, Ryan Drajewicz and Melissa McCaw. 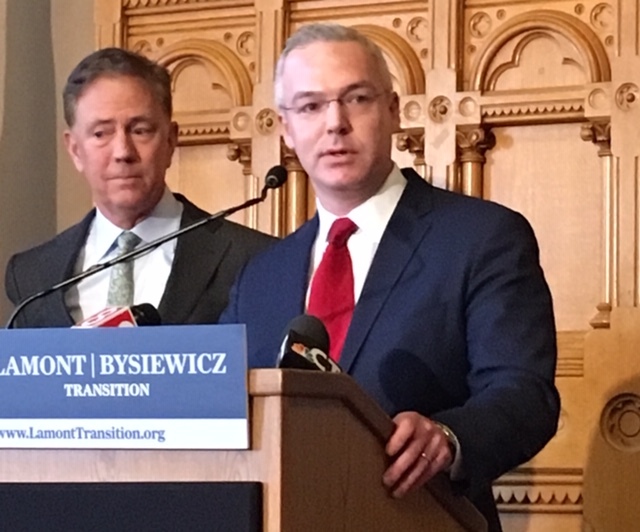 Gov.-elect Ned Lamont made his first appointments Tuesday, naming his transition director, Ryan Drajewicz, as his chief of staff and Hartford’s top fiscal official, Melissa McCaw, as his secretary of policy and management, the agency responsible for overseeing the state budget. Drajewicz, 39, of Fairfield, a former aide to U.S. Sen. Chris Dodd, has been an executive at the giant hedge fund, Bridgewater Associates, since Dodd left office eight years ago and has known Lamont since the governor-elect ran for U.S. Senate in 2006. 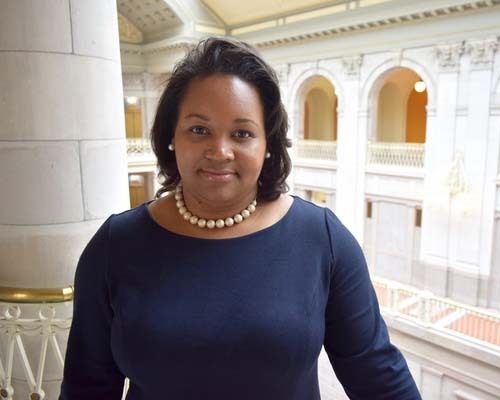 McCaw, 39, of Hartford, is a former OPM analyst, University of Hartford budget officer and, most recently, the top finance official in Hartford. The positions are what Lamont called the two most important in any administration. As chief of staff, Drajewicz will be the gatekeeper for the governor, expected to help keep the administration focused on a wide array of fiscal, legislative and political issues. McCaw will be responsible for crafting a budget in a state plagued by chronic deficits. In naming Drajewicz to oversee his transition, Lamont had signaled he most likely would become the chief of staff. But Lamont acknowledged in recent weeks he was conducting a wider look at potential budget directors before settling on McCaw. McCaw will be the state’s first African-American budget director. She faces the unenviable task of trying to stabilize state finances projected to be plagued by deficits for years to come, a problem tied to decades of inadequate savings from legislatures and governors between 1939 and 2010. McCaw has been struggling with another fiscal challenge in recent years, working with Hartford Mayor Luke Bronin, a Democrat who explored his own gubernatorial run before endorsing Lamont, to help the capital city avert insolvency. Annual contributions to pension funds and the state employees’ retirement health care program are projected to climb dramatically over the next 15 years. 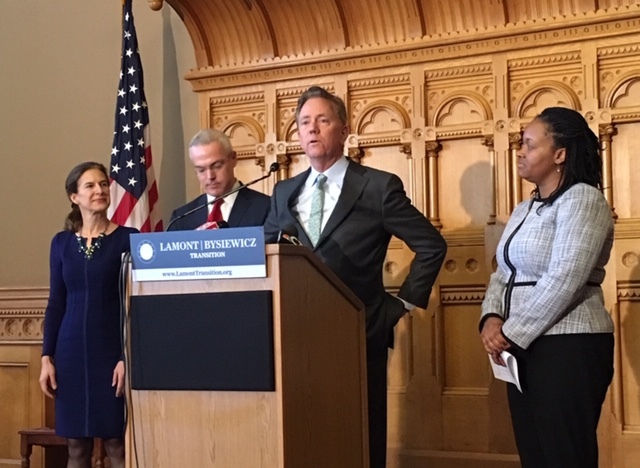 And Connecticut also must make payments annually on one of the largest bonded debt burdens — measured on a per capita basis — in the nation. State finances, unless adjusted, will run $1.7 billion in the red in the fiscal year that begins July 1, a shortfall of about 9 percent of the General Fund. And the potential gap grows to $2.3 billion or 12 percent by the 2020-21 fiscal year. Lamont must submit a plan to the legislature in mid-February to balance both fiscal years. The next governor already has complicated his task by saying he won’t tap Connecticut’s budget reserves, which currently total 1.2 billion and could reach as much as $2.1 billion after this fiscal year. But he reiterated Tuesday he is not averse to increasing revenue by expanding the reach of the state’s sales 6.35 percent sales tax, whose many exemptions gives Connecticut one of the narrowest sales-tax bases in the U.S.
McCaw has served as chief financial officer and budget director for the city of Hartford for most of the past three years. Prior to that she worked as budget director for the University of Hartford. Ryan Drajewicz, the governor-elect’s choice for chief of staff. This won’t be McCaw’s first stint in the Office of Policy and Management. Before her work with the University of Hartford, McCaw spent eight years as a budget specialist within OPM. She graduated from Wesleyan University with a master’s degree in public administration and also holds a certificate in public financial management from the University of Connecticut. With the selections of Drajewicz and McCaw, the incoming administration is likely to focus on rounding out key positions in the office of the governor, primarily legal counsel and a policy or legislative director. Lamont can move more deliberately on hiring agency heads, as did Gov. Dannel P. Malloy in many cases eight years ago. Drajewicz left Dodd’s employ as the deputy chief of staff. Since then, he has been part of the management team at Bridgewater, a hedge fund in the midst of a long-planned transition as its founder, Ray Dalio, steps back from day-to-day control. Lamont said Drajewicz was the de facto chief of staff to the two co-chief executives taking over from Dalio. Bridgewater’s core-management approach is to team managers with industry experts, rotating them to different units. He smiled when asked about his political skills, recalling his work traversing the state with Dodd, the only Connecticut politician to serve five consecutive terms in the U.S. Senate. “I learned from the best,” he said.